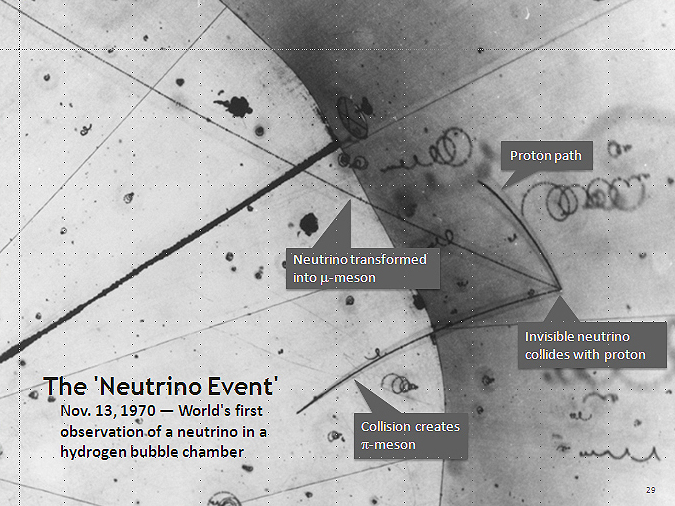 The neutrino is probably the most intriguing of all known particles. First postulated in 1933 by the physicist W. Pauli, its existence was experimentally proved in 1956 by Cowan and Reines, who built the first “neutrino detector” with 400 liters of water and cadmium chloride, placed it close to a nuclear reactor and detected for the first time neutrinos emitted by the nuclear core. This experiment proved that neutrinos exist and can be detected, although their interaction rate with matter is extremely weak. While the nuclear reactor used by Cowan and Reines emitted about 1013 neutrinos per second per cm2, their experiment would detect only about 3 neutrinos per hour! This is the reason why sometimes the neutrino is called the “ghost particle”. Neutrinos are able to go through solid matter (and the whole Earth!) without being stopped or interacting whatsoever. There are 3 types (“flavors”) of neutrinos known, each one paired with each of the charged leptons of the Standard Model: the electron, the muon and the tau. The muon neutrino was discovered in 1962 and the tau neutrino in 2000 (although largely anticipated since the discovery of the tau in 1974). Since their discovery a number of brilliant experiments have given precious additional information on the neutrinos: The Davis experiment at Homestake in the 70’s detected neutrinos produced in the nuclear reactions of the Sun. Later on neutrinos produced in the atmosphere were also detected. In 1998, the Superkamiokande experiment in Japan established a very important phenomenon: neutrinos “oscillate” between the different flavors along their propagation (that is, an electron neutrino may turn into, say, a muon neutrino after travelling a given distance), and shortly later results from SNO experiment in Canada corroborated it. Since then neutrino flavor oscillation has been seen with neutrinos from many sources: solar, atmospheric, nuclear reactor and accelerators. The general picture of neutrino oscillation is driven by a number of parameters: the 3 neutrinos masses and the 3 so-called neutrino mixing angles (and maybe an additional phase angle) The 3 mixing angles have been now determined by experiments (the last one, the angle theta-1-3, only very recently in 2012). Despite these achievements, doing neutrino experiments remain a very difficult task due to the their weak interaction, and we still ignore many things about them. For example we still don’t know what are the masses of the neutrinos. We know they are very light particles but they must have some mass (we know this because only massive neutrinos can oscillate). In addition, we don’t know whether the antineutrinos are the same particles as the neutrinos (like is the case, for instance, of the photon – we don´t talk about the “antiphoton”), or they are different particles (like the electron, whose antiparticle is called “positron“). There is a very promising experimental phenomenon that might give information on both the mass and nature of the neutrinos. It is called neutrinoless double beta decay. In nuclear physics many unstable nuclei may decay emitting an electron and a neutrino. This is the so-called “beta decay“, known since the early days of radioactivity (studying this decay is how W. Pauli postulated the existence of the neutrino). 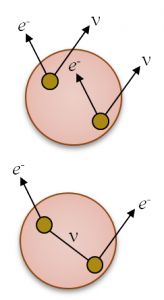 Some nuclei can also decay following two consecutive beta decays, double beta decay, emitting two electrons and two neutrinos. This can also happen (more interestingly) for nuclei that cannot decay with the single beta decay. There are about 35 naturally occurring isotopes in this situation (one of them is the Xenon-136). If the neutrino is its own antiparticle, a peculiar mode of this decay may happen, in which only two electrons and no neutrinos are emitted. It is called neutrinoless double beta decay. If detected, this observation would give evidence that neutrinos and antineutrinos are the same particle and would give information on their mass. Of course, this decay is extremely difficult to detect (if it exists) because the probability of occurrence is very low (less than a few events per ton of material per month). So far, this decay mode has not been observed experimentally, but it is being searched for by many groups, being one of the most important rare events in neutrino physics today. 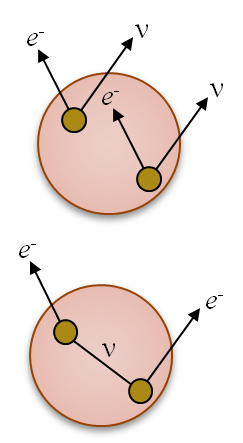 In the standard double beta decay (top) two neutrons of the nucleus decay into protons emitting two electrons and two (anti)neutrinos. In the neutrinoless mode only electrons are emitted. 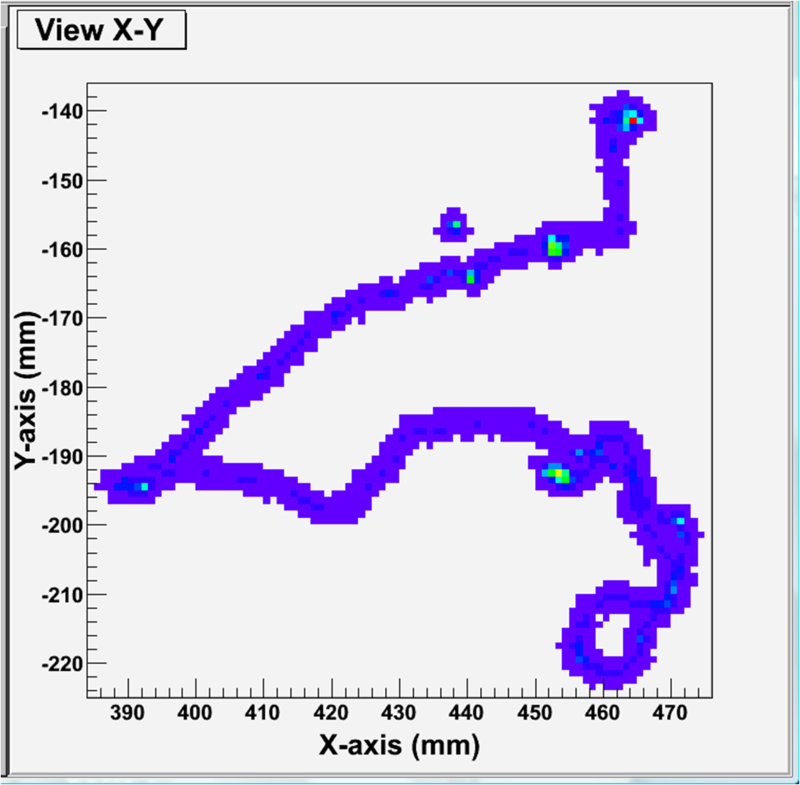 Computer simulation of the ionization track left by the two electrons from a Xe136 double beta decay in a gaseous (10 bar Xe) medium. This topology can be imaged by a TPC, and be used as a powerful “signature” to discriminate signal and background events. This concept was first applied in the 90s by the Gothard TPC. More recently, the NEXT experiment, in which our group participates, aims to build a high pressure Xe TPC with the same phisolophy. Part of the T-REX project is devoted to develop and test this kind of ideas, including the construction of demonstrating prototypes, to use TPCs for the search of double beta decay.